The community library consists of over 20,000 publications spread over several rooms. The challenge for both current librarians as well as users was to be able to search and quickly locate publications by author, topic or publisher – the catalog system used an adaptation of the Dewey system, but filed publications chronologically. The card catalog, which had been used for over 50 years was digitized in several stages. The first stage required scanning the cards (mostly hand written or typewritten), followed by further data entry performed by a team of nearly 20 volunteers and then a final edit and check. 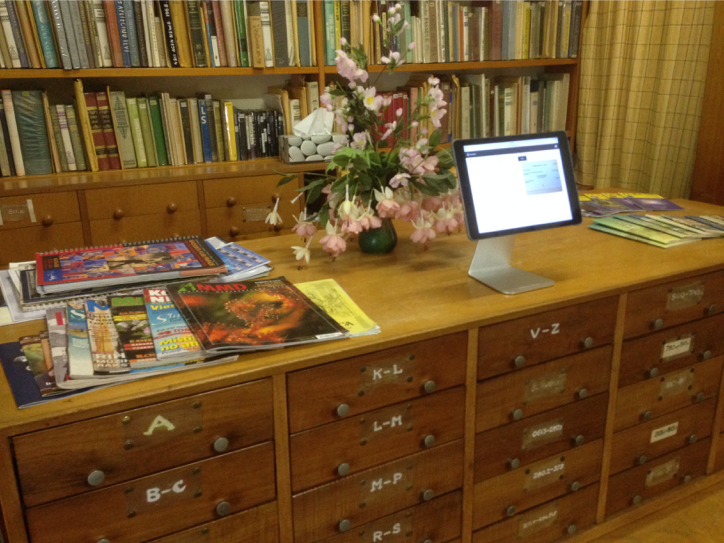 The result is a solution running on an iPad, which now stands on the top of the card catalog. Both librarians and visitors to the library have the ability to search a wide range of publications (books, magazines, brochures) as well as instantly locate publications with dynamic floor layout maps. This solution has also enabled the National library to discover rare publications that are unique to this library.